A member of the Legion of Super-Heroes, and the only inhabitant of the Phantom Zone who was not sent there for any crime. 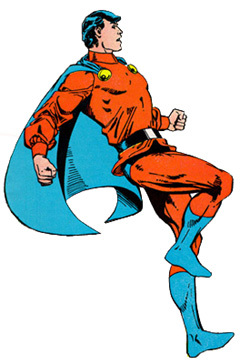 Mon-El is a native of the planet Daxam and is a longtime friend of Superman. His real name is Lar Gand and he is fully aware that Clark Kent is secretly Superman. Arriving on the planet Earth while Superman was still a teen-ager in Smallville (see Superboy), Mon-El discovered that, in the alien environment of Earth, he possessed super-powers identical to Superman's. Soon afterward, however, he was completely robbed of his super-powers as the result of a potentially fatal overexposure to lead, which affects Daxamites in the same manner as Kryptonite affects Kryptonians. To halt the physical deterioration wrought by the lead poisoning and thus save Mon-El's life, Superboy (the young Superman) projected his friend into the Phantom Zone. He will remain there unaging, until the thirtieth century A.D., when, thanks to a special "antidote serum" developed by Brainiac 5, he will be released from the Phantom Zone permanently to assume a regular role in the Legion of Super-Heroes.